The term Barbarian does not derive from the name of any tribe or cultural group. It is not a name one gives to oneself, rather it is given to others. The Greeks originally used the term to denote any foreigner of a different culture and language background. While it did not initially have a pejorative connotation, it was used by those of relatively advanced civilizations to describe others, who were considered less civilized. Thus, the term came to refer to people from more primitive cultures, whose people usually relied on physical strength more than intellect. Today, "barbarian" is used to describe someone using excessive violence without considering other options. Although barbarian cultures generally worked against the advancement of civilization, there are historical examples in which barbarian cultures and actions contributed to societal progress. In particular, when a culture has become stagnant and is in decline, pressure from barbarians can stimulate innovation and bring new energy, or can hasten the demise of a society that is seriously corrupt. The term "barbarian" is not derived from the name of any tribe or cultural group; there is no country called "barbar." The word comes from the Greek language, and was used to connote any foreigner not sharing a recognized culture or language with the speaker or writer employing the term. The word was probably formed by imitation of the incomprehensible sounds of a foreign language (“bar-bar”). Originally, it was not a derogatory term; it simply meant anything that was not Greek, including language, people or customs. Later, as the Greeks encountered more foreigners, some of whom learned Greek but spoke with a strange accent, the term took on the connotation of primitive and uncivilized. When the Greek civilization and culture was threatened by others (e.g. Persian or Gothic tribes) the connotation of violence was added. The Romans inherited this view from the Greeks, and in their encounters with different tribes across Europe usually called those tribes “barbarian.” However, being war- and conquest-oriented, the Romans admired barbarians as fearless and brave warriors. As the Roman Empire spread throughout Europe and Northern Africa they encountered various tribes and peoples. Some fought violently against the invading Roman armies, and continued raiding and looting after Roman conquest of their homelands. The Romans, with their well-organized military, regarded these violent and uncouth enemy tribes as barbarians. Although critical of their primitive culture, the Romans respected the bravery and fighting ability of barbarians. In the latter stages of the Roman Empire, around the fourth and fifth centuries C.E., the Romans even started to recruit young barbarian males to serve in the Roman army, a practice known as the barbarization of the Roman Empire. Gothic and Vandal soldiers were employed to protect the empire's outer borders. However, this encouraged barbarians to attack the Romans more, due to the perceived weakness that barbarization produced, and, in the long run, aided in the final breakdown of the empire. The following are examples of some of the tribes referred to as barbarian. The term "barbarian" does not come from the name of these people. Instead, the Berbers, a group of whom were originally known as Numidians, received the name "Berber" from the Roman term barbara or barbarian when they first encountered Romans. The Berbers have lived in North Africa for as far back as records of the area go. References to them occur frequently in ancient Egyptian, Greek, and Roman sources. The Byzantine chroniclers often complain of the Mazikes (Amazigh) raiding outlying monasteries. 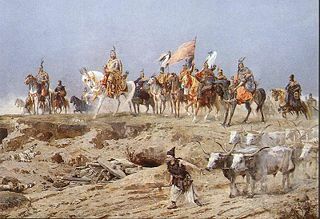 Invasion of the Goths: a late nineteenth century painting by O. Fritsche portrays the Goths as cavalrymen. The Goths were an East Germanic tribe which originated in Scandinavia (specifically Gotland and Götaland). They migrated southwards and conquered parts of the Roman Empire. Though many of the fighting nomads who followed them were to prove more bloody, the Goths were feared because the captives they took in battle were sacrificed to their god of war, Tyz (the one-Handed Tyr), and the captured arms hung in trees as a token-offering. 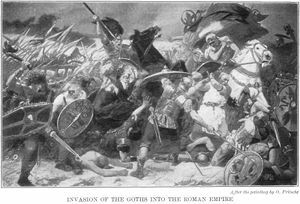 A force of Goths launched one of the first major "barbarian" invasions of the Roman Empire. (Hermannus Contractus, quoting Eusebius, has "263: Macedonia, Graecia, Pontus, Asia et aliae provinciae depopulantur per Gothos"). A year later, however, they suffered a devastating defeat at the Battle of Naissus and were driven back across the Danube River. The Huns, led by Attila (right, foreground), ride into Italy. 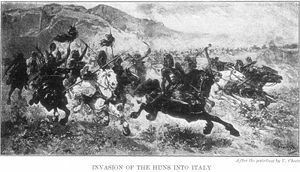 The Huns were a nomadic people who invaded Europe and built an enormous empire, defeating the Ostrogoths and Visigoths, and reaching the border of the Roman empire. They were primitive people, inspiring great fear throughout Europe as formidable warriors, skilled at archery and horsemanship, carrying out ferocious and unpredictable charges in battle. Atli. From an illustration to the Poetic Edda. Attila the Hun ca. 406–453) was the last and most powerful king of the Huns. He reigned over what was then Europe's largest empire, stretching from Central Europe to the Black Sea and from the Danube River to the Baltic. During his rule he was among the direst enemies of the Eastern and Western Roman Empires: he invaded the Balkans twice and encircled Constantinople in the second invasion. He marched through France as far as Orleans before being turned back at Chalons; and he drove the western emperor Valentinian III from his capital at Ravenna in 452. Though his empire died with him, and he left no remarkable legacy, Attila has become a legendary figure in the history of Europe. He is known in Western history and tradition as the grim "Scourge of God", and his name has become a byword for cruelty and barbarism. Some of this may arise from a conflation of his traits, in the popular imagination, with those perceived in later warlords such as the Mongol Genghis Khan and Tamerlane: all run together as cruel, clever, and sanguinary lovers of battle and pillage. The reality of his character may be more complex. The historical context of Attila's life played a large part in determining his later public image: in the waning years of the western Empire, his conflicts with Aetius (often called the "last of the Romans") and the strangeness of his culture both helped dress him in the mask of the ferocious barbarian and enemy of civilization, as he has been portrayed in any number of films and other works of art. The Germanic epics in which he appears offer more nuanced depictions: he is both a noble and generous ally, as Etzel in the Nibelungenlied, and a cruel miser, as Atli in the Volsunga Saga and the Poetic Edda. Prince Árpád crossing the Carpathians. 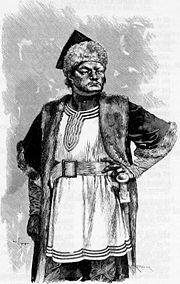 The Magyars are an ethnic group living primarily in Hungary and neighboring areas, and speaking a language of the Finno-Ugric family. Originally the Magyars were situated to the east of the Ural Mountains in Siberia, where they hunted and fished and developed horse breeding and riding. They migrated southward and westward, and in 896, under the leadership of Árpád the Magyars crossed the Carpathians to enter the Carpathian Basin. The century between their arrival from the eastern European plains and the consolidation of the Kingdom of Hungary in 1001 was dominated by Magyar pillaging campaigns across Europe, from (Denmark) to the Iberian peninsula. Their merciless looting caused them to be known as the "scourge of Europe." The Picts were a group of pre-Celtic tribes that lived in Caledonia, which is now the part of Scotland north of the River Forth. During the Roman occupation of Britain, the Picts continually attacked Hadrian's Wall. The Vandals were an East Germanic tribe that entered the late Roman Empire during the fifth century. They traveled through Europe until they met resistance from the Franks, who populated and controlled the Roman possessions in northern Gaul. Although they were victorious, 20,000 Vandals died in the resulting battle. They then crossed the Rhine River, invading Gaul. The Vandals plundered their way westward and southward through Aquitaine, finally crossing the Pyrenees mountain range into the Iberian Peninsula. The Vandals may have given their name to the province of Andalusia, in modern Spain, where they temporarily settled before pushing on to Africa, where they created a state, centered on the city of Carthage. In 455, the Vandals attacked and took Rome. They plundered the city for two weeks, departing with countless valuables. The term "vandalism" survives as a legacy of this barbaric plunder and senseless destruction. It should be noted, though, that many scholars believe that it was not barbarians or their culture (or lack of culture) that destroyed the Roman Empire. Rather, Roman culture was already in decline. Immorality, social indulgency, and greed destroyed the empire. Barbarians simply hastened the collapse (for further reading see Edward Gibbon's The Decline and Fall of the Roman Empire). Also, the sacking of Rome by a ragtag group of barbarians in 410 C.E., less than twenty years after the emperor Theodosius denounced paganism in favor of Christianity, stimulated Augustine to write the City of God. In this work he established God's heavenly city as the true and permanent home to be sought by Christians, compared to the "City of Man," such as Rome, which was clearly vulnerable to attack and without a secure future. Moreover, there are several aspects of barbarian culture that have contributed to modern culture and civilization. Many modern holidays are based on barbarian traditions and pagan rituals. Santa Claus and the Christmas tree, the Easter bunny and Easter eggs all have their roots in different barbarian festivals. Teutonic, Celtic, and other tribes introduced gold-working techniques, making beautiful jewelry and other ornamentations in styles very different from the classic tradition. Teutonic tribes brought strong iron plows that succeeding in farming the forested lowlands of northern and western Europe. There is also a claim that Celtic and Teutonic tribes developed a 12-based mathematical system (as opposed to the 10-based decimal system), which continues to be the basis of certain units of measurement in the United States to this day (see Francis Owen, The Germanic People: Their Origin, Expansion, and Culture). Barbarian stories such as Beowulf, Kalevala, Der Ring des Nibelungen, and the tales of King Arthur provided great contributions to classic literature. Many famous fairy tales (e.g. tales of the Brothers Grimm) are also based on barbarian legends and myths. In the New Testament the term "barbarian" is used in its Hellenic sense—to describe non-Greeks or those who merely speak a different language. For example, in Acts 28:2 and Acts 28:4 the author, probably from the Greek-Roman standpoint, refers to the inhabitants of Malta (formerly a Carthaginian colony) as “barbarians.” Similarly, in Colossians 3:11 the word is used for those nations of the Roman Empire that did not speak Greek. The writer of Romans 1:14 suggests that Greeks together with non-Greeks (i.e. “barbarians”) compose the whole human race. The term here, therefore, merely indicates a separation of Greek-speaking cultures from the non-Greek-speaking ones, the term itself not bearing any deprecatory value. However, elsewhere in the Bible this is not the case. In 1 Corinthians 14:11 Paul uses the term in its derogatory sense—to describe someone who speaks an unintelligible language. "If then I know not the meaning of the voice, I shall be to him that spoke a barbarian, and he that spoke will be a barbarian unto me." Paul here denounces the speaking in tongues, comparing it with the barbarian (i.e. foreign) language, which is useless if it cannot be understood, therefore not being able to convey the message from God. Philo and Josephus, together other Roman writers, used this term to separate Greco-Roman culture from other cultures, implying the supremacy of the former. From the cross-cultural perspective, the term “barbarian” is used in the context of the encounter of two different cultures. Many peoples have regarded alien or rival cultures as "barbarian," because they were unrecognizably strange. Thus, from this perspective the term has a rather pejorative meaning. For example, the Greeks admired Scythian and Eastern Gauls as heroic individuals, but considered their culture to be barbaric. Similarly, Romans saw various Germanic, Gaul, and Hun tribes as essentially barbaric. The Chinese (Han Chinese) regarded the Xiongnu, Tatars, Turks, Mongols, Jurchen, Manchu, and even Europeans as barbaric. The Chinese used different terms for barbarians from different directions of the compass. Those in the east were called Dongyi (东夷), those in the west were called Xirong (西戎), those in the south were called Nanman (南蛮), and those in the north were called Beidi (北狄). This way of describing foreigners was adopted by the Japanese when Europeans first came to Japan. They were called nanbanjin (南蛮人), literally "Barbarians from the South," because the Portuguese ships appeared to sail from the South. Today, Japanese use gaikokujin (外国人 literally translated as "outside country person") to refer politely to foreigners. The term gaijin (外人 literally translated as "outside person") is also used today to refer to foreigners, with somewhat mixed connotations since this term was originally used to refer to someone as an "outsider" or "enemy." However, the term gaijin does not include any reference to whether the person is a "barbarian," in the sense of being uncivilized or violent. From the sociological viewpoint, the concept of “barbarian” is connected with, and depends upon, a carefully defined use of the term civilization. Civilization denotes a settled (city/urban) way of life that is organized on principles broader than the extended family or tribe. Surpluses of necessities can be stored and redistributed and division of labor produces some luxury goods (even if only for the elite, priesthood, or kings). The barbarian is not an integrated part of the civilization, but depends on settlements as a source of slaves, surpluses and portable luxuries: booty, loot and plunder. A distinction, however, needs to be made between the concepts of “culture” and “civilization.” Rich, deep, authentic human culture exists even without civilization, as the German writers of the early Romantic generation first defined the opposing terms, though they used them as polarities in a way that a modern writer might not. "Culture" should not simply connote "civilization." In this sense, barbarians are those of a different culture, who depend on the civilization dominant in the geographical area where they live. Barbarian culture should not be confused with that of the nomad. Nomadic societies subsist on what they can hunt and gather, or on the products of their livestock. They follow food supplies for themselves and/or their animals. The nomad may barter for necessities, like metalwork, but does not depend on civilization for plunder, as the barbarian does. From the psychological perspective, the term “barbarian” can be associated with a stereotypical image of someone who is not a member of one's own group. As Bouris, Turner, and Gagnon (1997) put it, “Stereotypes function to represent inter-group realities–creating images of the out-group (and the in-group) that explain, rationalize, and justify the inter-group relationship” (273). Accordingly, group thinking creates a specific context for inter- and intra-group relationships, which use stereotypes as a means of group interaction. For social psychologists, inter-group relationships (cooperation-competition, in-group status) are closely associated with intra-group relationships. Sentiments and behavior of the in-group members, usually seen in a positive and morally correct light, are created in opposition to members of other groups. Positive and moral self-image is attributed to all members of the in-group, while on the other hand, out-group membership is regarded as less valued. Stereotypes and negative images of the out-group are thus constructed to serve the function of degrading the out-group and keeping the balance between in- and out-group membership. The barbarian image serves to demean the members of the other group, creating a morally justified reason for separation from that group. Out-group barbarians are usually depicted as extremely strong but irrational, evil without moral judgment, destructive and violent, whose leaders rely more on emotion than intelligence. This is contrasted with in-group members, who are gentle, moral, and of superior intelligence. Thus, in- and out-group members cannot/should not be mixed together. In this way the intra-group balance is established. (For further reading see Cottam (1986) and Herrmann (1985)). Bouris, R. Y., J. C. Turner & A. Gagnon. 1997”. Interdependence, Social Identity, and Discrimination.” In R. Spears, P. Oakes, N. Ellemers, & S. A. Haslam (Eds. ), The Social Psychology of Stereotyping and Group Life (273–295). Oxford, UK: Blackwell. Boulding, K. 1959. “National Images and International Systems.” Journal of Conflict Resolution 3, 120-131. Cottam, M. 1986. Foreign Policy Decision Making: The Influence of Cognition. Boulder, CO: Westview Press. Gibbon, E. 1983. Decline and Fall of the Roman Empire (R.E. Williams, Ed.). Smithmark Publishers; Abridged & Illus. edition. Herrmann, R. K. 1985. Perceptions and Behavior in Soviet Foreign Policy. Pittsburgh, PA: University of Pittsburgh Press. This page was last modified on 29 August 2008, at 13:16.